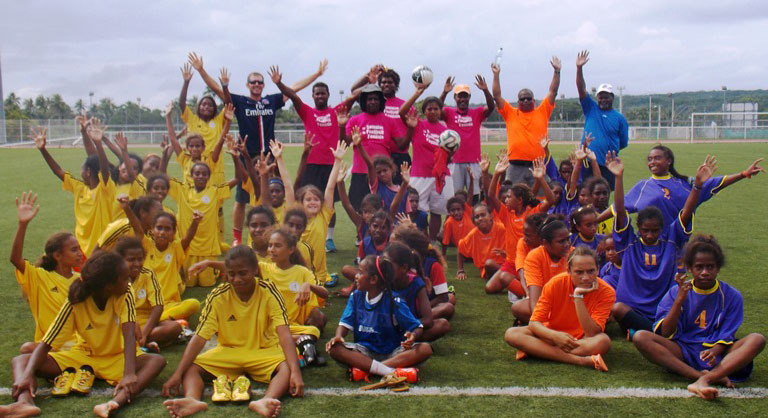 Women’s Football is a priority for FIFA, OFC and all the Member Associations across the Pacific and for coaching staff in New Caledonia it is an area of huge growth. Just under 1000 women have registered with FCF with that number increasing consistently since 2011. The Semaine du Football Feminin brings football activities to girls across the nation as an introduction to the various football disciplines. Close to 250 young girls took part in activities organised from Kone in the north to Lifou and Mare in the Loyalty Islands. FCF organised for the donation of footballs and equipment to get some small competitions underway, and on Mare 40 girls were involved in a beach soccer festival. Having given the women of New Caledonia a taste of football, New Caledonia technical director Dominique Wacalie says there are still plenty more activities planned for the women’s game this year. “Every Wednesday, in partnership with the Caisse des Ecoles de Dumbéa, le SMS de Nouméa et l’ASEANC in Païta, we are organising women’s festivals. “There is also festivals in Lifou, Mare and Ouvea for 11-12 year olds, the Inter-Provincial Games and the U-16 Championship in the south and north,” Wacalie says.